Parr’s oeuvre with the primary focus on its political commitment, rather than presenting it from the perspective of its formal or technological drives or a tightly thematic fashion, say landscape and eco-politics. 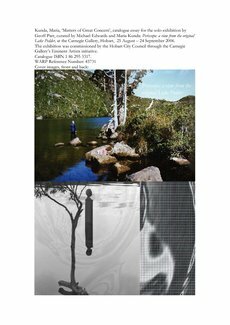 A number of strategies presented as plausible options: his work has made the transition from analogue to digital, and there has been an abiding concern over decades with natural environment and landscape themes. However we – the curators and the artist – wanted to take a broader and less prescribed direction, to explore what we tentatively referred to, in the early stages of planning, as issues-based works. Over decades, political and historical issues have driven Parr’s art practice. It has been informed by his green activism, his professional life as a leader in tertiary art educational – professorship and politicking for the arts, and his avid interest in local and global events (he writes wry and sometimes impassioned letters to the editors of the local and national papers), and a strong sense of history, art history and design. So much is clear.